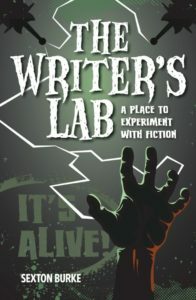 I’m enjoying THE WRITER’S LAB by Sexton Burke. Lots of cool writing prompts. Randa’s [what was I thinking with that name? nevermind] ability to change her body had given us countless nights of pleasure. Any female body type we could imagine was ours to enjoy in the privacy of our bedroom. But as I stood across from her in the kitchen, watching her make her skin transparent, I realized there was one type of body alteration she couldn’t do. She wept as her skin peeled back to show me. An octopus-like mass of black tendrils enveloped the major arteries to her heart and lungs. Cancer. It pulsed in time with her heart beats. Randa, for all her magical body-morphing abilities, could not cure herself of sickness. The skin continued to retract down her abdomen. What else did she want to show me? A fetus the size of my thumb floated in her uterus.